François Flameng (1856–1923), The Cliff of Craonne (1918), further details not known. Wikimedia Commons. Before the outbreak of the Great War in 1914, François Flameng (1856–1923) had been a highly successful portraitist, a painter of history, friend and travel companion to Jean-Léon Gérôme, Georges Clairin, Paul Helleu and John Singer Sargent. And he had painted one gruesome work showing a highly controversial episode in French history. Information about Flameng’s second career as a war artist is scant. He seems to have been granted official status early in the war, and painted watercolours of what he saw from the earliest months of the battles in northern France. 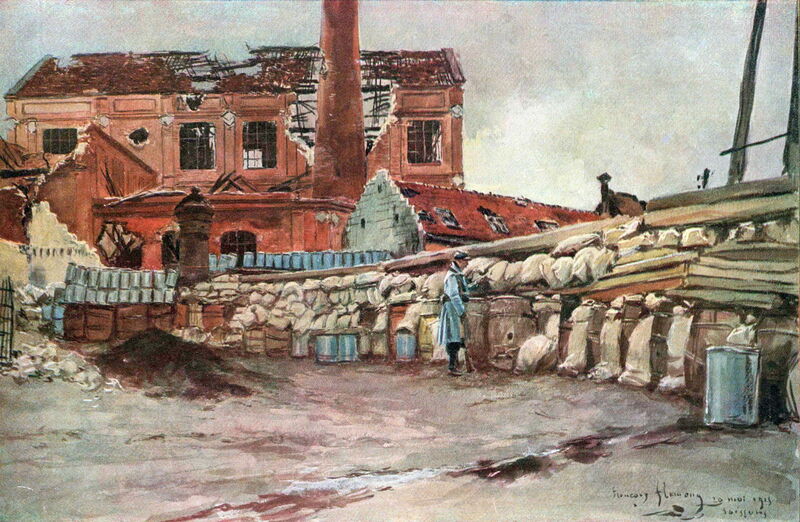 François Flameng (1856–1923), Barricade in the Distillery of Vauxrot, Soissons (1915), further details not known. Wikimedia Commons. 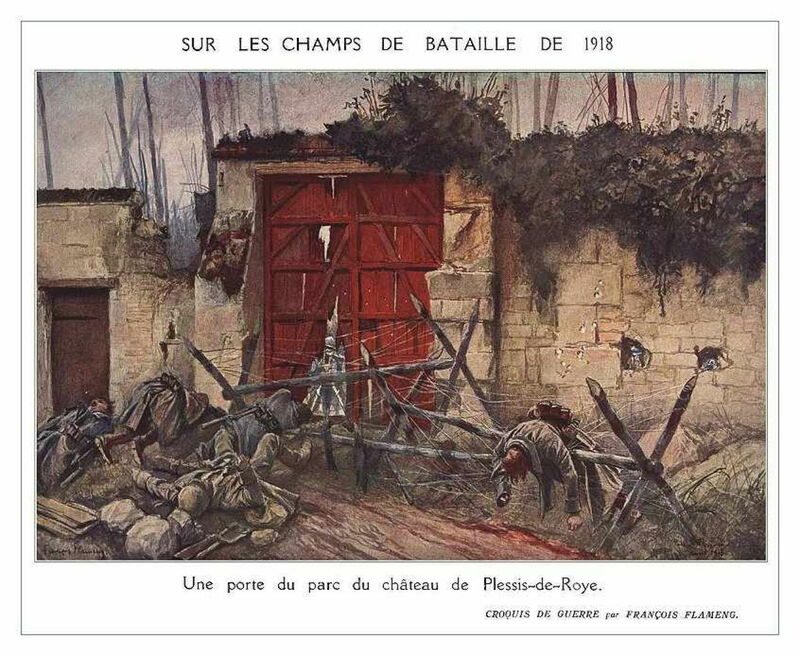 In early 1915, Flameng was painting in the Soissons area during the first battle of Champagne, which took place around Soissons, to the north-east of Paris. 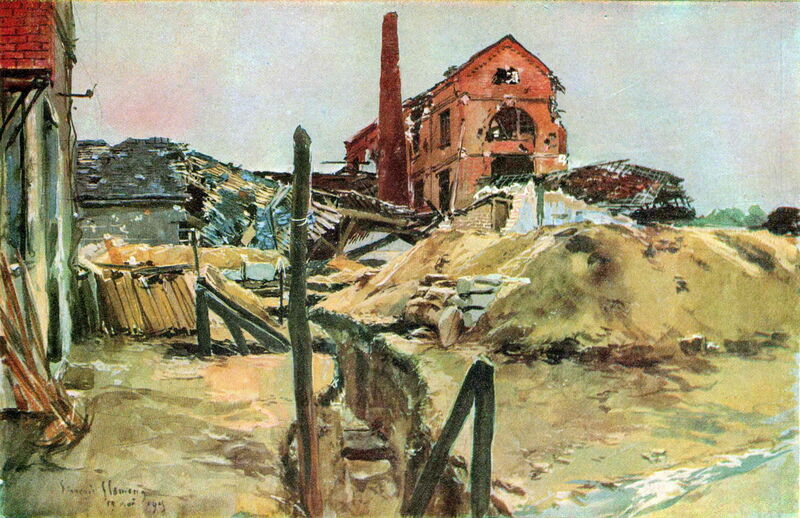 Many of his views show the destruction and military works which had taken place, here in his Barricade in the Distillery of Vauxrot, Soissons from 1915. François Flameng (1856–1923), Trenches in the Distillery of Vauxrot, Soissons (1915), further details not known. Wikimedia Commons. Trenches in the Distillery of Vauxrot, Soissons (1915) is another view of the same site. 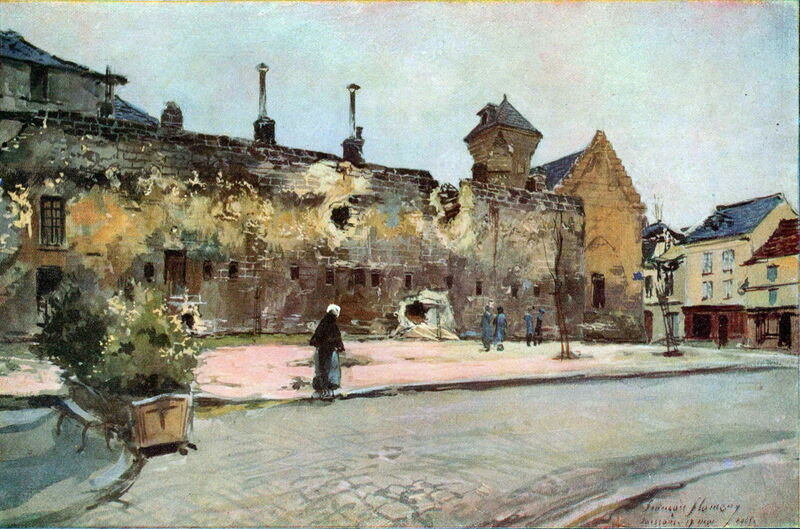 François Flameng (1856–1923), Soissons Barracks (1915), further details not known. Wikimedia Commons. Soissons Barracks (1915) shows the damage in the town itself, with the occasional civilian walking around. 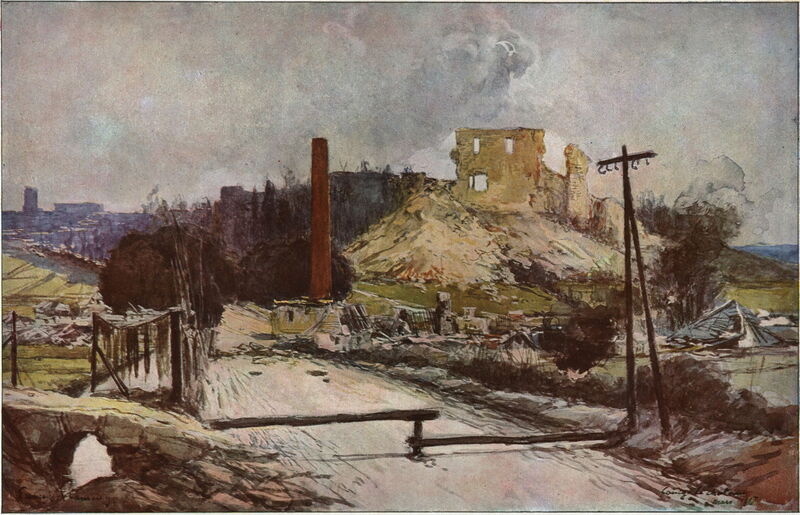 François Flameng (1856–1923), Coucy-le-Château after the German Destruction (1917), further details not known. Wikimedia Commons. Coucy-le-Château after the German Destruction from 1917 shows the scant remains of a castle near Soissons which had been built in the 1220s. It was occupied by the Germans in September 1914, and when they were withdrawing from this area in 1917, its keep and four towers were blown up on the orders of General Ludendorff, which caused public outrage. François Flameng (1856–1923), The Offensive of Yser, The French Front Line near Het-Sas (1918), further details not known. Wikimedia Commons. Flameng’s paintings of the destruction of the landscape are particularly moving. The ghostly remains of trees look like the ribcage of a vast skeleton in The Offensive of Yser, The French Front Line near Het-Sas from 1918. 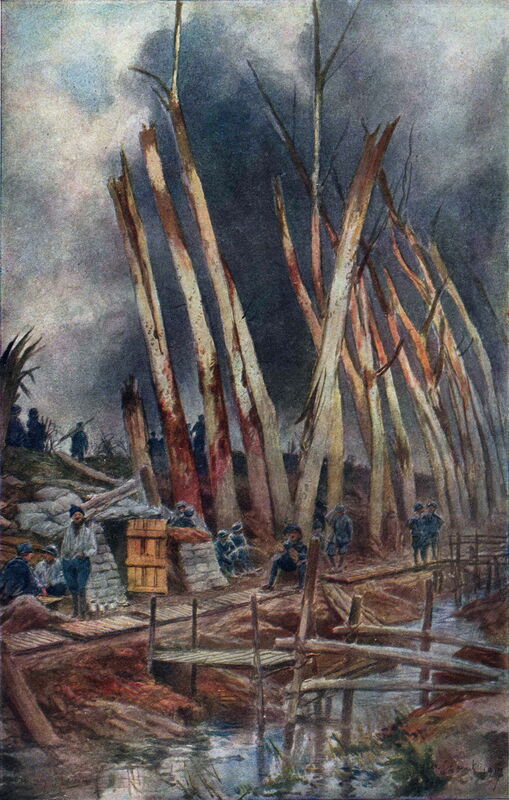 François Flameng (1856–1923), The Offensive of Yser, Bombardment of the German Lines (1918), further details not known. Wikimedia Commons. He also painted some of the major nighttime battles, including The Offensive of Yser, Bombardment of the German Lines (1918). 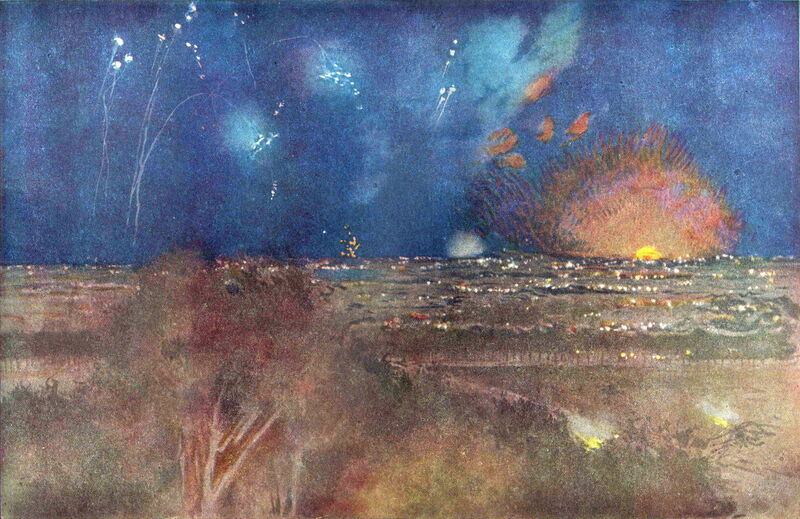 François Flameng (1856–1923), Return of a Night Bombing Flight of Voisin Aircraft (1918), watercolour and gouache on cardboard, 31 x 48 cm, Musée de l’Armée, Hôtel des Invalides, Paris. Wikimedia Commons. 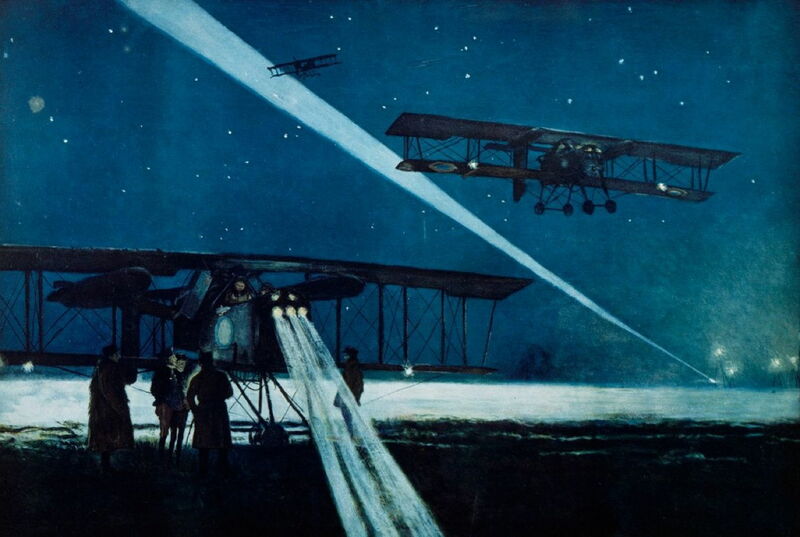 His watercolour of Return of a Night Bombing Flight of Voisin Aircraft from 1918 is perhaps one of the best paintings of the war in the air. François Flameng (1856–1923), The Entonnoires of Ham (1917), further details not known. Wikimedia Commons. 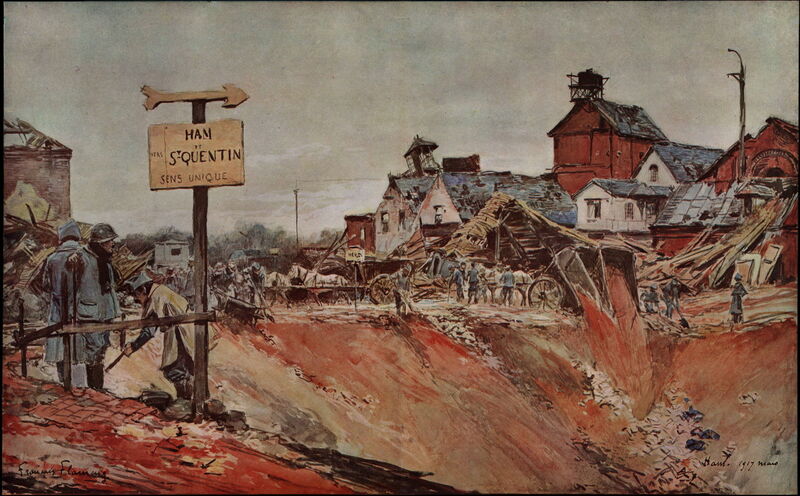 In The Entonnoires of Ham (1917), farm carts are being used to fill in a huge pit which has severed the main road to St Quentin. The soil and buildings appear red with blood. François Flameng (1856–1923), Germans (date not known), further details not known. Wikimedia Commons. Some of Flameng’s paintings must have been posed. 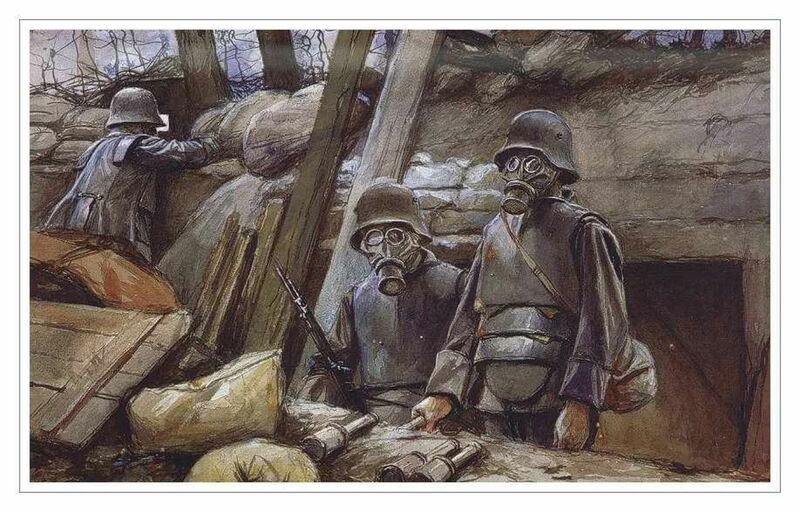 This undated scene of Germans in traditional plate armour and gas masks may have been constructed using prisoners, perhaps. François Flameng (1856–1923), Attack (1918), further details not known. Wikimedia Commons. 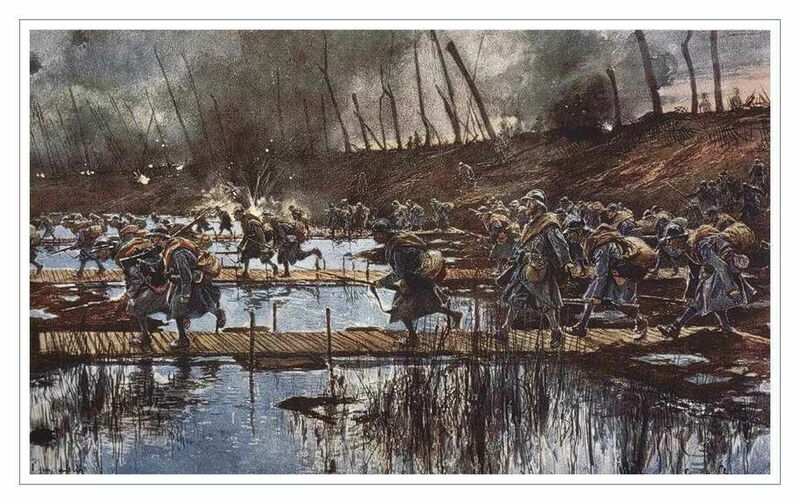 This view of an Attack (1918) being made on duckboards over flooded marshland brought home a vivid picture of what actually happened. These paintings, many of which were not published until the end of the war, brought criticism for their reality. François Flameng (1856–1923), A Park Gate of the Château de Plessis-de-Roye (1918), further details not known. Wikimedia Commons. A Park Gate of the Château de Plessis-de-Roye (1918) shows a particularly poignant scene, set in this village in the Oise, again to the north-east of Paris. During the battle of Matz, part of the second battle of the Marne, in June and July of 1918, nearly five thousand French cavalry were killed here, and the village was razed to the ground. François Flameng (1856–1923), The Message (Neyon, March 1917) (1917), further details not known. Wikimedia Commons. 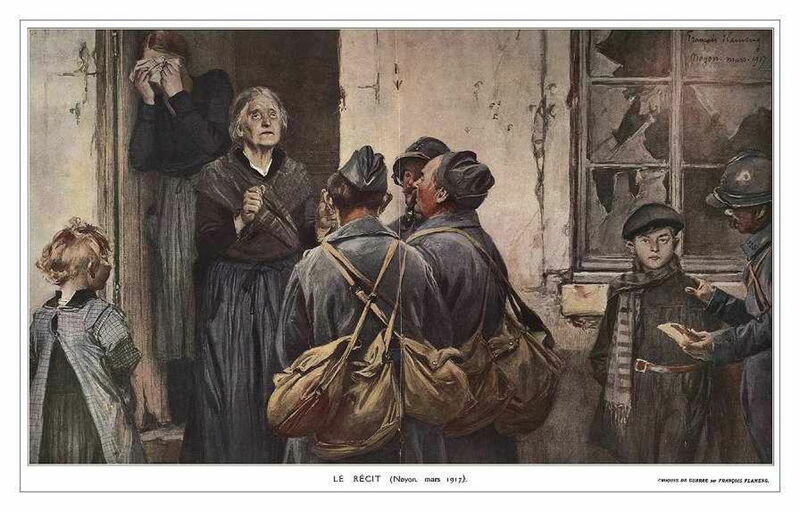 Watercolours like The Message (Neyon, March 1917) (1917) showed the very personal tragedies too. Here three soldiers tell a mother, wife, and children of the death of their man. 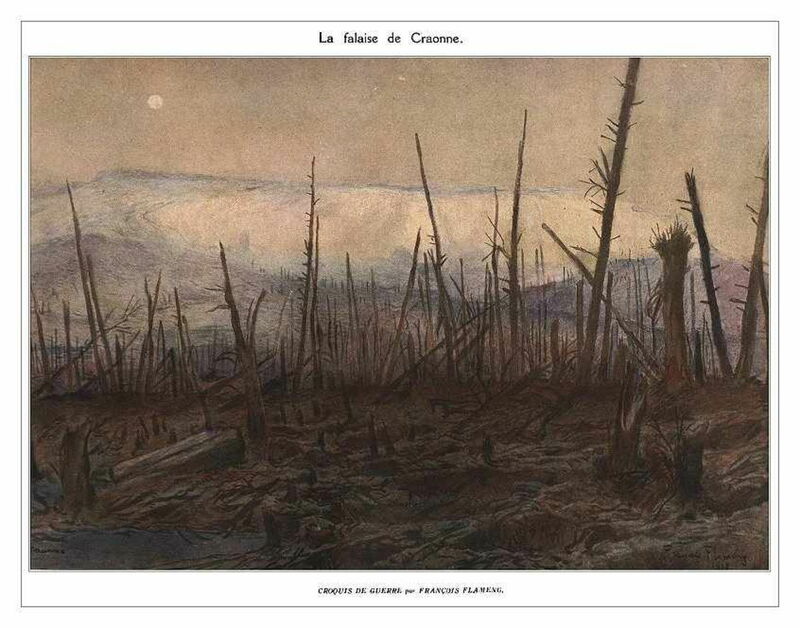 This scene of utter destruction at The Cliff of Craonne (1918) shows part of the battlefield of the Aisne in 1917 which gave rise to one of the famous anti-military songs of the Great War, La Chanson de Craonne. Despite the critics, François Flameng was acclaimed as one of the greatest of the war artists of the time, and made honorary president of the Society of Military Painters. In 1920, most of his war paintings were donated to the Musée de l’Armée in Paris, in the Hôtel National des Invalides, where they are exhibited. Posted in General, Life, Painting and tagged Flameng, Helleu, painting, Sargent, war, war artist. Bookmark the permalink.